Check out our new videos and horses online! Julie-Pascale may call herself "Queen" of Mechelen Jumping during the year. This last international competition is undoubtedly the jewel in her crown of a fantastic year. On her impressive Talent, Julie-Pascale managed again to keep all the strongest international horsewomen behind her in a full house at Nekkerhal. No less than 19 combinations participated in the jump-off and all of them fought for the highly prized gold. In the one but last combination Julie-Pascale rode an amazing faultless jump-off in a time which was no less than 1.2 seconds better. This title adds a wonderful achievement to her memorable record. On Saturday evening there was a full house present in Moorsele with a large number of French-Belgian participants. Talent set the pace by again demonstrating his indisputable jumping competence on a highly technical course. At the jump-off (1,45m), 10 contestants lined up at the start, of which Julie-Pascale rode 2 seconds faster than the former French Champion Jacques Bonnet. Naturally the gold stayed in West Flanders (Belgium). Both Guillaume and Julie-Pascale can reflect on their fantastic start of the winter season last weekend. On Saturday evening Julie-Pascale won the 1.40m jump-off with her trustworthy Talent. A Brazilian combination came second and Guillaume made third place on Copy Picobello. On Sunday afternoon the "Grand Prix" took place and both Talent and Copy made it to the jump-off. Ten combinations participated in this highly prized competition. Jody Bosteels won gold and Guillaume on Copy was good enough for bronze in a strong 1.45m jump-off, Julie-Pascale on Talent achieved seventh place. A 50% share in Marvella has recently been sold to Mexico. As a 6 year old, she had already been a winner in Lummen (Belgium) and in the World Championship she finished an honourable seventh place. The 8 year old mare also put her name to the 1.40m on the world's most prestigious track of Alfonso Romo. Furthermore, she was also classified in the 1.45 m category. Marvella is being moved to Palm Beach in Florida, where among others she will participate in the Nations Cup competitions and in the 1.50m category. The 9 year old mare Wodiena who was bread through Major x Alme at the 'Sommes' stables has now been sold to Dubai. Last year Julie-Pascale won the Belgian Young Riders Championship and also achieved first place in the finals of the European Championship on this top class horse. Wodiena was sold by Picobellohorses to a sheikh who made a gift of the mare to a rider on the condition that the mare remained the property of the "State of Dubai". On the final day of the competition at "Het Zilveren Spoor" (in Moorsele – Belgium) Talent again showed his exceptional jumping power and his indisputable consistency. Out of six starts he won 4 first places, a second and a third place. The highly competitive peloton went all out in this highly prized Challenge Competition. The spectators were able to enjoy top class sport on the highly technical courses. Christophe Vanhooren achieved a well deserved second place and Julie-Pascale, this time on Marvella, again got third place on the podium. 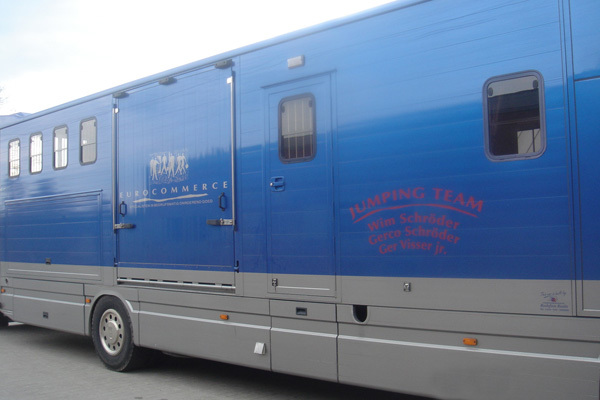 Antwerp Harbour was the ideal setting and "the place to be" for a highly respected jumping event. The organisers didn't leave anything to: perfectly organised infrastructure, jetset environment, and above all top sport. Guillaume rode successfully on Sao Paulo and Vainquer in the International Young Riders Competition and came 2nd, 3rd and 6th in the Grand Prix Ranking. 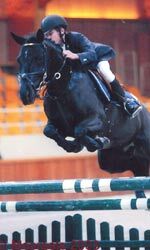 Julie-Pascale rode on Wynona and Marvella in the Golden League and was classified on identical places, as her brother Guillaume was, in the Grand Prix. In the sections "Stud Farm" and "Competition" you can find several new videos of both our young horses and our competition horses. Have a quick look at them! TALENT SCORES A GOLDEN "HAT TRICK"
Last weekend a very ambitious and strong group of contestants participated in the third Challenge. The long and technically difficult course gave an excellent opportunity for Talent to achieve his third victory. With his exceptional jumping ability he was able to beat all the other contestants in the jump-off. At present Julie-Pascale has three Challenges to her name and with these wins on Talent she heads the score so far in the intermediate rankings. In the meantime due to Marvella's consistency Julie-Pascale has also been awarded second place in the score so far in the intermediate rankings. Congratulations! Guillaume and Vainquer: a successful combination ready to go again. The International Young Riders competition, with no less than 14 participating countries, also took place during the CSI 5-star competition held in Lummen (Belgium). Guillaume rode his trusted stallion 'Vainquer' again after it had recovered from a lingering hoof injury. Together with his super fast jumper Sao Paulo, they won 5 places of honour. Vainquer, ridden by Guillaume, who became Belgian Champion in the juniors' category earlier, showed his class and consistency. Together, Frederic Vernaet, Karline De Brabandere and Chloé Ockerman, defended Belgium in the Cross Country Competition achieving fourth place. On the last and final day of the competition Guillaume only made one single time fault. Only four combinations out of 67 contestants made it to the jump-off. Vainquer has made his mark and is back in the running again. JULIE-PASCALE ON TALENT IS AGAIN THE WINNER OF THE CHALLENGE. There was a large number of prominent contestants present at the International Competition held in Moorsele in Belgium. No less than 420 combinations in different categories competed for the honours in the first official open air competition this season. Guillaume made himself noticed with perfect consistency on both Wodiena and Sao Paulo. Sao Paulo won the "Kleine Grote Prijs" on Sunday and even managed fifth place twice in the additional competitions. Wodiena finished fifth in the 1.40m competition and achieved a fourth place in the highly technical Grand Prix(1.45m). Julie-Pascal won her first challenge on her trusty steed Talent in Pottes (in France), where she became the Belgian Champion with the Young Riders last year. Approximately 42 combinations, of which only six made it to the jump-off, were present at the start. The course was very long and extremely technical and to a very high standard. Julie-Pascale rode a clear round both on Marvella and Talent. Marvella rode super fast and won the jump-off, she finished 3 seconds faster than the second fastest time for those with only one single jumping fault and was placed fifth. Again Talent demonstrated his quality and competence. 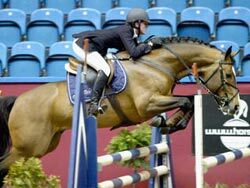 The 19 year old Finnish horsewoman Sonja Leena Hungerbuhler came 5th in the Grand Prix in Barcelona on Unforgettable Picobello; also Jorg Kreutzmann came 8th in the 150m CSI in Frankfurt on Sauternes Ter Vlucht, who had previously been sold - via Ludo Philippaerts. These results from last December confirm the successful year 2007. The year 2008 has also known a successful start thanks to Julie-Pascal, who won 1st and 2nd place in the 'Nocturne' on Saturday evening, on her own bred horses Talent and Picobello Marvella. Last week both the Juniors (16-18 years) and the Young Riders (18-21years) competed for the European Gold Medal in Auvers in France. All nationalities sent their 5 best riders to defend the individual prize as well as the country prize. The Polish participants and the new Russian participants performed surprisingly well on their pedigree jumping horses. On the first qualification day Julie-Pascale confirmed her Champion's Title and achieved a well earned fourth place. During the next couple of days the technically very difficult courses (1.50-1.55 m) caused a large number of changes in the intermediate rankings for all riders, with clock-like regularity. Julie-Pascale successfully got Wodiena back into the final, where she started as number 14 in reverse order amongst the best 30. Julie-Pascale, at the tender age of 21, has already proved her mettle by her record of qualifying 7 times for the finals of the European Championships out of 7 entrances. Congratulations! Marvella, a youthful 7 year old, scored seventh place in the 1.45 m competition on the final day of the Championship. 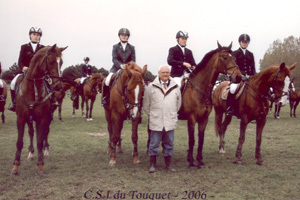 JULIE-PASCALE WINS THE 2007 BELGIAN CHAMPIONSHIP FOR YOUNG RIDERS. On the third and final day and in tropical weather conditions, 19 combinations of the original 70, who appeared at the start, were held back for a double final competition. The wheat was quickly separated from the chaff by Eugène Mathy who set up some technically very difficult tracks. Julie-Pascale only made one single jumping fault in the four heats and won the Belgian Champion's Title by a large margin of 9 points. Congratulations ! Last Saturday evening the town of Hooglede in Belgium was transformed back to the flower power era. No less than 230 invited guests were present to celebrate Julie-Pascale's 21st birthday till the small hours. The atmospheric pictures below undoubtedly give a good impression of the splendidly attired guests, who were clearly enjoying themselves at the party. For the first time two off-springs from 't Is Voltaire and a two year old Aertbreaker stallion will leave for Russia this week. A brand new complex intends to use these Picobellohorses products as the foundation for their planned stud farm. As far as passion and enthusiasm are concerned, the best is only good enough for them. For the very first time, the national coach selected three Young Riders and one senior Rider to defend the Belgian colours. Pieter Devos (Tequila), Julie-Pascale Ruant (Picobello Wodiena), Jan Vlemmix (Unforgettable Picobello) and Ignace Philips (Guldenboom Winona) competed in the Country Prize Competition (1m50). 16 countries were represented at the start of which the 8 best ones had to ride a second round. The Belgian "Jonge Beloften" acheived a well-deserved shared fourth place which earned them an honorary mention. On Sunday the Grand-Prix took place. It was a technically difficult track (1m50 - 1m55). A hard luck fault prevented Julie-Pascale on the youngest jumping horse of the competition, Wodiena, from participating in the jump-off. Her team mate, Pieter Devos, won magnificently and earned the Grand Prix Award on his jumping horse Tequila, which was in excellent condition. ANTWERP JUMPING COMPETITION REBORN: 6 OUT OF 6 FOR PICOBELLO'S "JONGE BELOFTEN"
This competition is synonymous with prestige, organisation, interest and international top riders and to crown it all the weather was fantastic. Both the organiser Alex Geurts and all the invited guests had a really splendid time. Julie-Pascale and Guillaume provided stiff competition in the highest ranked 1* star categories. Both managed to achieve second place and narrowly missed first. In the 7 year olds category they again showed their consistency and both Guillaume, this time on Copy as well as Julie-Pascale on Marvella achieved faultless rounds during the three days competition. Amongst the contestants, there were international talents such as Rodriqo Pessoa, Sofia Kroon, Ludo Philippaerts, Dirk Demeerseman, Peter Wylde, Jos Lansink,... All the young 7 years olds had to jump a technically demanding 130/135 track. During a 3 week period the world's top competitors, who are preparing for the coming outdoor season, almost certainly paid a visit to Lummen, Belgium, to view the terrain. The highly rated participants that jumped 4 different courses for all levels of 5 and 6 year old horses in the Grand Prix Competition, performed at their best. Julie-Pascale and Guillaume were again amongst the most consistent riders in the various classifications. The 7 year olds Marvella and Copy were both among the best in a number of classifications and Marvella even achieved a brilliant second place. To crown it all Julie-Pascale on Wodiena finished 6 seconds ahead of the entrant from New Zealand in the 1m35 category on the final day. Guillaume and Julie-Pascale were the outstanding riders at the first International outdoor contest of this season. Their consistency was rewarded in every contest with their names given places of honour in the Young Horses competition as well as in the 130 and 140 events. On the opening day Julie-Pascale had already won on Marvella in the 7 year old category. Guillaume made himself noticed on Only and achieved a new honourable title on his new 7 year old talent Copy (Carthago x Abgar). Sao Paulo(Libero x Pilot) achieved a 3rd, 4th and 6th place in the 130/135 contests. Last weekend the FINAL of the GRAND WINTER CUP was held in "Het Zilveren Spoor" (in Belgium). No doubt all the riders came along to the start with their best horse, in order to qualify for the substantial prize money and the final trophy. Last year Julie-Pascale had already won the final on Talent and in doing so, she managed to secure a ticket for the Brussels Jumping competition. This year she has won the final on Wodiena, her recently new jumping wonder. A dozen contestants showed their ingenious skilfulness in the jump-off; but Wodiena, the wonder mare, came first and left all the others far behind. With her skilfulness and her unlimited vigour she finished two seconds faster on the clock. NO WORDS BUT ACTIONS: REAL CHAMPIONS !!! This season, two long jump competitions have already been organised in the Province of West Flanders. The stallions 't Is Voltaire and Aertbreaker ensured a champion in their category. An off spring from 't Is Voltaire won in the three year old category in the Flandria Ranch. A couple of months ago, his elder and more vigorous brother had already been sold to Canada. (breeder: Inge Devrieze) In the Stud Farm "De Hunters" in Poperinge (Belgium), an off spring from one of the first foals from Aertbreaker unanimously became the champion in the two year old category (see photograph). Breeder: Jozef Feys. Meanwhile the two stallions have already started a new breeding season and are available at Picobellohorses. 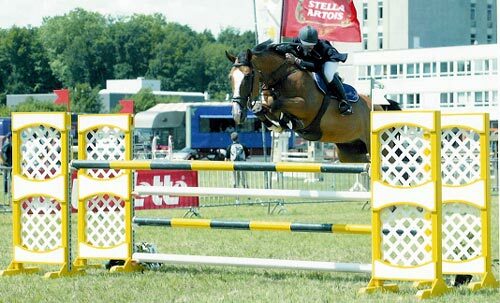 The contestants competed fiercely for all the medals of honour at the International Jumping held in Hasselt (Belgium). Julie-Pascale and Guillaume achieved some remarkable places on the supplementary list of rankings. Sao Paulo certainly was the eye catcher and achieved a supersonic time in amongst a group of 65 contestants and won the 130/35 metres competition. In one of the world's most prestigious 5 star jumping competitions in Paris, Peter Wylde again achieved a second place on 'Meatry's Pleasure' which had been sold recently by Picobello Horses. 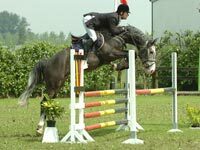 At the same time, in the Cup Cmpetition held in Moorsele (Belgium), Guillaume on 'Sao Paolo', his rising star, [see archive picture] also managed to steal a second place. There were approximately 60 combinations at the start of the extremely technical course. Fourteen appeared at the jump-off, of which, Sao Paolo, Marvella and 't Is Voltaire (making his first appearance after an injury) were the 3 participating horses, belonging to Picobello Horses. The 6 year olds from Picobello Horses all got a well deserved rest period after the World Championship for young horses and a successful summer. At the end of this month they'll begin training in preparation for a new and hopefully successful season in the 7 year olds category. There was a fierce battle in all classes for the medal of honour at the International Jumping Competition held in Liège (Belgium), where a 4 star title was awarded. A field of experienced international entrants showed first-class competition in all categories. For 3 days Guillame has been riding there very efficiently and regularly. Vainquer was amongst the winners at the prize-giving ceremony. Sao Paolo came second and earned a place in the additional classification. In this respect she proves that she is now ready for the real job. For the third time Nelson Pessoa organised one of the most prestigious competitions in Tour&TaxiS in Brussels, the capital of Europe. In the Bronze League Julie-Pascale wan the first round on the 6 year old Marvella. Guillaume was able to twice achieve third place on "ONLY", his little jumping marvel and the favourite of the audience. On the final day the two stable riders were very keen on winning the Grand Prix. Top sport showing class, style and quality. The final was won handsomely by Guillaume on Only Picobello. His sister, despite a tremendous effort, stalled at 90/100. Every year the World Championships for 5, 6 and 7 year olds take place in Zangersheide. In the category of the 6 year olds (220 participants), both Guillaume on "ONLY", bred by Picobello and Julie-Pascale on "MARVELLA" made their appearance at the start. The results and their consistency during the last season were confirmed here. On the first day, Only made one (jumping) fault, the next couple of days she rode clear rounds. Her class and fortitude delighted everybody. Marvella didn't pass unnoticed because during these three days she didn't make one single jumping fault. Due to one time point in the final, she was held back at the jump-off and Julie-Pascale finished at a respectful 7th place. She was the "first Belgian" in this competition. CONGRATULATIONS anyway! On the prestigious course at Zangersheide, "Only Picobello" and "Marvella" were selected thanks to their strong results. Both Guillaume on Only and Julie-Pascale on Marvella received an endorsement there to be able to prove themselves again at the World Championship amongst all the internationally well-known riders. The home-bred Only is a daughter of Pleasure, now ridden by Peter Wylde and is a previous 3 times winner of the World Championships, at that time ridden by Erik Van der Vleuten. There was a strong turn-out and a large number of entrants on the first day of the Final of the Belgian Cup held in Pottes. 72 combinations were present at the start of the two day competition with the best combinations going through to the finals on Sunday. The level was high and the good ground conditions worked to the advantage of 24 strong show jumpers. The excellent jumping horse Vainquer, who has performed really well recently, achieved an impressive victory. Last weekend, for the very first time, a 4 day two star International (jumping) Competition was held in Bonheiden. A large number of famous riders and even some Americans had put their name down for this competition. In spite of a couple of heavy downpours, the participants competed strongly for the medal of honour. Guillaume again did justice to his Belgian title. In an incredible jump-off (1.40m- 1.45m) on Vainquer, Guillaume achieved a very fast time but unfortunately he had to give up his title due to a fault at the last jump. In the category of the 6 & 7 year olds he won twice on his wonder horse ONLY. The outstanding class and fortitude of both horse and rider were amply rewarded by winning the Final on Sunday (see video). THE "2006" CHAMPION'S RESULTS HAVE BEEN CELEBRATED WITH A "CHAMPION'S PARTY"
Last weekend around 120 partygoers gathered at the Picobellohorses establishment. The champions of 2006 in the following categories were: Pupils (Gilles Detry), Junior Riders (Guillaume Ruant) and Young Riders (Pieter Devos). They were flown in by the helicopter belonging to Chris Callewaert. Guillaume, who has achieved a second Belgian Champion's Title and won the Belgian Cup once, was kept on the dance floor till the wee early hours. Together with his father, who celebrated his birthday, they were treated like kings. The pictures below certainly give a good impression of the party spirit amongst the many guests. Last weekend the 2006 Belgian Championship for Juniors and Young Riders was held in Bruges. During the 3 day event, around 70 Junior Riders and about 40 Young Riders competed for the Champion' s Title. The demanding technical tracks and the high fences quickly separated the wheat from the chaff. Tropical temperatures were extremely exhausting for both horses and riders alike. Julie-Pascale, with the Young Riders, achieved excellent results on her new horse "Pronkjuweel" and she actually succeeded in getting fourth place, although she just missed the presentation ceremony. Meanwhile, Talent who has just come back from participating in the European Championship held in Athens, where he was the finalist, is enjoying a couple of weekends of rest. Guillaume has been selected for the Juniors and Julie-Pascale for the Young Riders together with the four best Belgian riders per category to participate in the European Championships in the prestigious city of Athens. The course where the former Olympic Games took place is without a doubt "the place to be" between July 6 � 9 for future international talent. The new national coach who was in charge of the Belgian team for many years has selected Wouter Devos, Kevin Spiessens, Delphine Falciani, Sandra Buytaert and Guillaume Ruant for the Junior team. For the Young Riders Jonathan Dourcy, Cathérine Halleux, Jan Vlemmix, Pieter Devos and Julie-Pascale Ruant have been selected. We wish the representatives of the Belgian flag good luck and know that they will try their best in tropical Athens. An off-spring from 't Is Voltaire again surprised everybody in the cycle for young horses � four year olds (the eldest off-springs) � held in Moerzeke. As mentioned previously, the jumping technique of all his off-springs together with quality and precision excel. 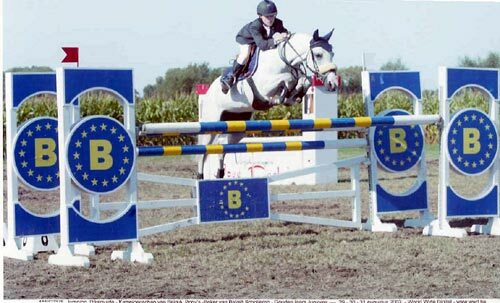 The photographs below show the show jumping horse as a 2 and 3 year old and also as the winner of the free style jumping competition in the region. One of the certified off-springs from 't Is Voltaire has already been purchased by the internationally renowned 'Albert Zoer' jumping stables and stud farm. The stallion, which is currently named 'Turbo Borra' after a West Flemish breeder from Koekelare, has been put in service by its new owners. All the strongest teams were in action at the CHIO competition held in Utrecht last weekend in preparation for the European Championship which is to be held in July in Athens. The Belgians had an enjoyable time. After their victory in Le Touquet, the Young Riders Team again achieved a victory with a lead of no less than 12 points. Congratulations! The participating team: from left to right: Jonathan Dourey, Gudrun Patteet, Julie-Pascale Ruant, Jan Vlemmix. The new team leader, Jean Paul Musette, beamed with joy at the occasion of his successful comeback. He replaces Bea Vanpaeschen, as she wants to spend more time supporting her own children. Le Touquet � Dream Resort for the Belgian team. Last weekend a lot of young and talented Belgian riders enjoyed a nice stay at the fashionable seaside resort of Le Touquet in France. The Nations Cup for Ponies, Young Riders as well as for Juniors were held on the third and last day. Strong participating countries such as the Netherlands, Great Britain and France had to give in to the Belgian Junior Team (see picture from left to right Guillaume Ruant, Eveline Quintelier, Thomas van Minnebruggen and Ellen Celis) and also to the Belgian Young Riders Team (see picture from left to right Christophe Deraedt, Julie Pascale Ruant, Pieter Devos and Karline Debrabander). The technical track - 1.35 / 1.40m - for Juniors was ridden on a large soggy wood shaving covered field in two heats. Nothing could spoil the fun and a first Belgian double victory was secured. Marvella, Sao Paulo and Talent trendsetters for the Picobello Team. Julie Pascale (on Talent) and Guillaume (on Vainquer) could establish themselves, together with their team members, in the victory of the Country Cup but they also proved that they both had at their disposal a new and really worthy, skilled and fully fledge horse. For the first time Guillaume rode a new brood-mare (Sao Paulo) with an international record (Libero x Pilot) on an international level and he achieved third and seventh place. Julie Pascale drew the attention in all tracks with the still very young six year old Marvella, she achieved a second, fourth and fifth place in the 1.35m category for Young Riders. 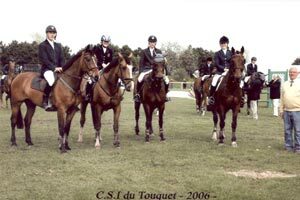 The mascot 'Talent' again showed his class and consistency and came third on the first day and fourth in the Grand Prix of Le Touquet 2006. Picobello's start of the season at the Challenge in Pottes. Guillaume on ONLY in the category for the young 6 year olds showed the quality and class of Picobello's self bred products. The move of the young 'Aertbreaker' could probably have been foreseen because of the high interest of many prominent stables and top-class riders from inside and outside the country. They guarantee him a spectacular future. In this way the BWP bred Aertbreaker (Heartbreaker x Ramiro) really honours our stud stables. Not only his dream pedigree but most of all his flexible competence linked to his unlimited power tickle the imagination. The young very promising off springs of 'Aertbreaker' look very much like him. No doubt we will have the opportunity to watch 'Aertbreaker' and his international rider Schroder on television. Picobello Horses was able to maintain further the promised contractual service fee (650 Euro) for fresh sperm for all breeders for 2006. We wish Eurocommerce and 'Aertbreaker' every success! The professional attraction of Lummen seems to be Julie Pascale's favourite competition. After she achieved 9 out of 9 clear rounds on Talent, Marvella and Aertbreaker two weeks ago, she again today achieved the same result on Talent and Marvella. On Marvella she finished well up front with the 6 year olds and on Talent she achieved a fourth place amongst the strong senior participants in the 1.40 / 1.45m height competition at the top level. Succesful start of the season for Guillaume at the International held in Moorsele. Last week Guillaume was for the first time riding on his youngest stallion 'Vainquer' and he was able to be classified in the supplementary ranking in the prestigious international competition held in Lummen and this weekend he is ready to start the open air season and he will enter his name for the first Grand Tour for Juniors. Lummen International . Two places of honour for the 6 year olds. Last weekend Lummen was again the attraction for many professionals who didn't want to miss the start of the season on grass with their highly qualified jumpers. An extraordinary final ranking with a first and third place over the three days for the 6 year olds of the Picobello stables. Lisa Murphy from Great Britain was second. About 70 international combinations from 12 different countries participated in these competitions with their best jumpers. Julie Pascale achieved on Marvella and Aertbreaker a first and third place of honour. Aertbreaker convinced everyone of his special class and power. 03-apr-2006 BWP presentation of stallions: Aertbreaker really impresses. BWP � Waasland presented a very strong organisation and selected a lot of participants in Moorsele. Aertbreaker was present with the 6 year olds where he showed his impeccable value again. His strong step and power linked to his natural and consistent, precise jumps characterize him as a real competition stallion. The jumps for the 6 year olds were raised to 1.45 / 1.50m in the small ring and so Aertbreaker could emphasize his flexibility and power once more without a single jumping error. 12-mar-2006 'Wild Card' for Brussels Jumping and Julie Pascale as the final winner. 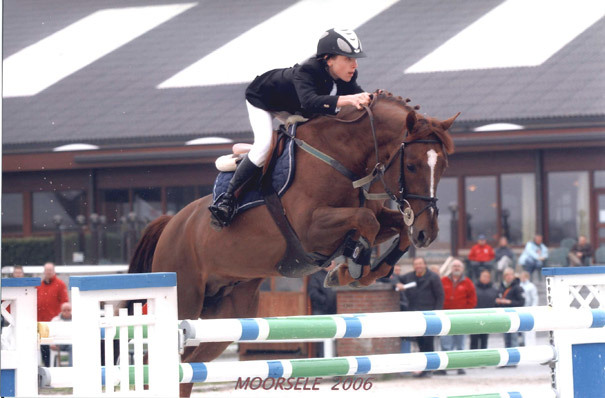 At the last and strongly fought final of the Grand Cup held in Moorsele, Julie Pascale achieved a respectable fifth place. Her consistency during the whole of the winter season where she didn't make any jumping faults resulted in a final victory and a 'Wild Card' for the Brussels Jumping donated by Nelson Pessoa to the value of 10.000 Euro. 'In-house' bred Talent brings honours to Picobello's stud stables. 25-feb-2006 Talent is the most consistent horse at the Winter Cup. Last weekend strong participants put up a strong showing in the jump-off. The super jumper Talent gave his all and again finished at a respectable second place. The very fast time set by Philippe Vandoorne could not be matched. Dominique Hendrickx and Vincent Voorn wanted to win gold and silver but remained unplaced. 05-feb-2006 Candy Lupe made a strong impression in the 'Zilveren Spoor'. Guillaume on the proficient Candy was able to stay in front of two international combinations in the strongly participated 1.30 competition. The Frenchman Marine Gallet was a second slower and the Dutch woman Marlies Soest was four seconds slower. 01-jan-2006 Best wishes for 2006. 26-dec-2005 Picobello's Vote was sold to Richard Davenport. Again an 'in-house' bred product that was sold to the British World Cup Rider at the age of 5. Vote's mother (see picture) had been sold earlier to Ireland and is under the saddle of Richard Melonie. Vote (Voltaire x Maja de la Cour) was an embryo from Picobello's Spiritual (Major x Landgraf). At the beginning of this year Picobello's Winner, also a product of Spiritual, was sold to a Canadian investment group. The off-springs are assured because Winner had three embryos from 't Is Voltaire and Vote had two from Aertbreaker. 04-dec-2005 Grand Prix at the Moorsele Grand Cup is another success story. After stopping for a while to concentrate on her studies Julie Pascale made a fresh start and, as everybody was wary of her competitiveness, she was able to quickly make her mark among the top level riders. 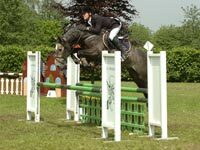 'Talent' who had already won the Small Cup two weeks ago, achieved again a double clear round as a top class mount and came a strong second (see video and list of results). 27-nov-2005 Julie Pascale wins the second section of the Winter Cup, Guillaume came first. In Moorsele on Saturday there was a great deal of interest for the 3rd Winter Cup. 36 riders were selected. After a rest period due to injury Julie Pascale and her trustworthy jumper Picobello's Talent were able to give a jumping demonstration in the ring. His strong power and alertness in the jump were phenomenal on the basic track as well as in the jump-off. On her new horse 'Chudak' she was able to achieve eighth place. Click on the yellow button for the list of results. 20-nov-2005 Allaerd continues his success story on French soil. 12-nov-2005 Guillaume wins the Winter Cup in Moorsele. As the youngest rider, Guillaume won the second Winter Cup in which a strong international presence was prominent and was able to hold back all the Arabian riders. Vainquer, a 7 year old jumper won effortlessly the 1,35 highly technical basic track. In the 1,40 jump off Vainquer demonstrated that he had the power and achieved the shortest time. For track and jump off click on the video button below. This extraordinary stallion gave a demonstration. Over the last couple of days his reputation was established as a valuable new asset to the Belgian stud farms. His pedigree (Heartbreaker x Ramiro), his suppleness and power guarantee a successful future. 26-sep-2005 Aertbreaker makes a positive impression in the second qualification. 25-sep-2005 An approved stallion has been put on 't Is Voltaire's record. At the large and comprehensive stallion certification during the World Championships a number of stallions were approved. Direct from his first year an off-spring from 't Is Voltaire has been given certification and was added to his record. Paul Schokemöhler, the owner, was also previously number 1 in the world. He was certified under the name of 'Turbo Borra' and was also bred there. His exceptional jumping technique together with his power contribute to his exclusive physic and he was unanimously certified. 19-sep-2005 Kantjes Allaert sold to French Champion. Last but not least Guillaume's last pony was sold to our southern neighbours. He was sold to a first class address in Normandy after a strong finish at the previous season as winner of the Belgian Cup and after winning his last competition in 'Fieracavalli' in Verona (Italy). Meanwhile Kantjes Allaert was selected for the French Team and he will participate at the highest level under the saddle of the current French champion. 21-sep-2005 A foal from 't Is Voltaire has again been selected at the 2005 Zangersheide Auction. Toberlina (off-spring from 't Is Voltaire) has been put up for auction at the busy auction held for top class foals and 3 year olds. After the classification of the World Championships on 24/9 at 6 pm, this prestigious auction will commence. For more information or to bid by telephone contact 089 / 73 00 30. 06-sep-2005 't Is Voltaire is the 2005 Champion for West Flanders. Last weekend about 70 combinations lined up for the start at the highest level to compete for the Championship. After the first day Picobello rider, Brecht, came a respectable 19th out of the 20 that made it to the finals. On the final day and on a muddy and heavy track the stallion demonstrated his excellent staying power and tenacity. Brecht was able to improve on his previous time by 4 seconds. The consistency of the pair during the last season was awarded with the 2005 Championship Title. 19-aug-2005 The off-springs from 't Is Voltaire much sought after abroad. Recently the ninth product from the eldest off springs (3 year olds) from 't Is Voltaire has been sold to the renowned stables of Charles in England. Some promising spring aces have been sold to France as well as to Sweden (Sörensen) and last but not least Paul Schockemöler put up an off-spring at the Stallion Auction held in Oldenburg. 11-aug-2005 't Is Voltaire leads the Consistency Criteria. 't Is Voltaire qualified three times at the three day national jumping held in Langemark. He came second, third and on the final day again second and this earned him the most consistent horse in the competition. In that same competition the Belgian Championship for female riders was held too. Gudrun Patteet was the best 2005 horsewoman. 28-jul-2005 Foals from 2005 in Picobello's stables. 18-jul-2005 2005 Belgian Cup: Guillaume proves very impressive in the final. Guillaume achieved a third and fifth place with his two horses at the extremely well organised 3 day 'Brugge Jumping Event. About 70 combinations appeared at the start and on the last and final day the best 35 could compete with each other. Vainquer, the very young 7 year old stallion made a very good time in the last jump off and although he made one jumping error he still earned himself a place on the winning stage. 'Candy Lupe' came fifth. Click on picture of Vainquer for video. Click on picture of Candy Lupe for video. 07-jul-2005 First foals from Aertbreaker are on show. 10-jun-2005 Aertbreaker : top class. 30-may-2005 Aertbreaker is determined to make his way to the top. Aertbreaker again left a really strong impression in his two clear rounds in the last 2 cycles in Gesves and Aalter. His flexible power and quality prove his top class. No doubt Aertbreaker attracted the attention from a number of international riders. 03-may-2005 Aertbreaker keeps on surprising in the Cycle. Aertbreaker keeps on surprising in the Aalter Cycle. He achieved a brilliant second place in the category of the 5 year olds and he jumped with a frisky power. Aertbreaker keeps on surprising even in the stud farm. He breeds very special, elegant and large foals which all have a darkish to black colour. Their movements display a high degree of suppleness and vitality. 27-apr-2005 Picobello launches a new website for the hiring out of party materials. Picobello, the market leader in Belgium for the hiring out of party materials, launches its new website that will offer the opportunity to order all products on line. 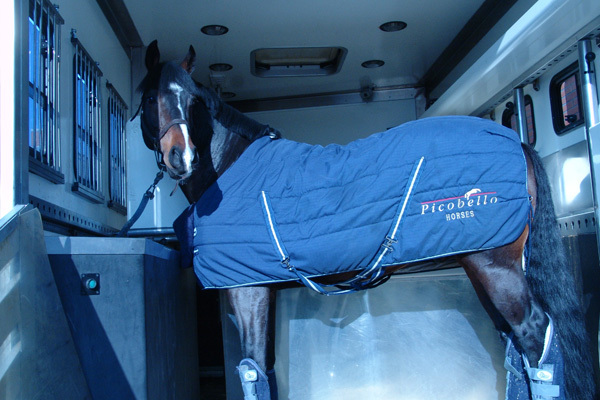 A large number of major events, inside as well as outside of the equestrian world, are increasingly using the services offered by Picobello. Be sure and take a look at www.picobello.be. 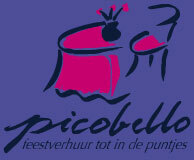 Both sites www.picobellohorses.com and www.picobello.be have been generated by the team of www.galop.be. Beautifull mini-pups on earth. Peanuts herself is very little - 20 cm, as the father. The father has an exceptional grey color. Her below you can see the pups. Peanuts, the mini jack russel had about 4 weeks ago 6 beautifull mini pups. After the usual winterstop,T' is voltaire prepares himself for the season. He's been jumping again since two weeks. His qualities and carefulness are founded in all his clear rounds. On the second last cup in Moorsele he knew how to make a clear round and got by that the 2nd place in the 1,35 course with his rider Brecht. The promissing Winner of own breed became recently sold to an investments group that the mare further will prepare for the topsport. became in Evergem. De breeding appears insured. Between the world cup test, we got knew appeared in 's worldly largest horses event and dotaded disciplines the apaloosa testing. Before the auction the stable Picobello was able to buy the young stallion itself and to bring with to the stables back in Belgium. De stallions get a little brother. In the most difficult international ponyshow in the Italian Verona (Fiera cavalli) Guillaume knew how to to get the Sm.Gr.Prix back on its name. Last year he did this with Skylight that meanwhile is sold to the Catwalk Stables. It became a crown on the work of Guillaume's pony time. This was most likely its last competition. In the Italian PRATONI Vincent Martens knew to qualify himself as best belgian on the European Championship Military with the through Picobellohorses bred Treffer. He rode the heavy cross clear round and got yet as only belgian an individual class lilac. Before this season the combination won already different other heavy competitions. 17-sep-2004 Guillaume set its successful pony time further at the horses! Guillaume obtained in Arezzo with Otrichta and Corbusier 3 times a 2de place, with Allaert a 2nd place in the nations cup and with Skylight a 3rd and 4th place in the big pony derby. Next to the fabulous 2nd place for the Belgium Team, Hanne Mertens won wi hthe wonderfull jumping pony Sylvie the Pony Derby. On the family show Diksmuide, Guillaume almost won twice the Belgium Cup. He did win the Belgium Cup Ponys but unfortunately he hit in the 2nd jump off the fence with his foot. That made him go to a 4th place. After a nice and succesfull time competing international and european shows Guillaume won as closure the titel: "Belgium Cup 2004". This time with Picobello Allaerd. The show of Diksmuide has become a legend to our stables. Since 2000 till 2004 our stable has won all championships that have been ridden on that ground. twice Julie-Pascale and twice Guillaume. new photos from our foals and stallions. On our "stud farm" pages, you will find new photos from our foals and stallions. 09-aug-2004 't Is Voltaire proves competitive and his off-springs confirm this in Evergem. 't Is Voltaire ridden by Julie Pascale achieved a strong fourth place at the Belgian Championship for female riders in Langemark. Foals from all over Belgium and all pedigrees gathered in the sunny town of Evergem. About 250 foals competed for the final place and the very promising off-springs from 't Is Voltaire again achieved a fourth place. 02-aug-2004 Extie was sold to the Swedish northern neighbours. 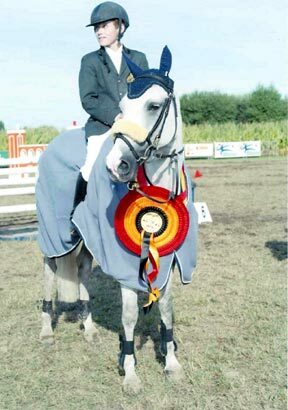 26-jul-2004 European Championship for Ponies. We wish the entire Belgian team that will participate in the European Championship for Ponies every success. This year the European Championship will take place in Poland from 29 July until 1 August. Above the entire pony team with Jean Jacques Matthys as captain. Julie Pascale Ruant came 17th in the individual list of rankings and 4th with the Belgian team. 17-jul-2004 3 Belgians were selected for the final of the European Championship. The Belgian team achieved a fourth place at the Nations Cup during the European Championship held in Vilamoura. 3 Belgians have been able to qualify for the final tomorrow: Jan Spaas, Charlotte Theisman and Julie Pascale Ruant. 15-jul-2004 Belgians excel on the first day of the European Championship held in Vilamoura. All 5 Belgian combinations acquired a clear round on the first day of the European Championship for Juniors. Julie Pascale Ruant on Talent was the first Belgian. 04-jul-2004 European Championship for Juniors. We wish the entire Belgian team that will participate in the European Championship for Juniors every success. This year the European Championship will take place in Vilamoura (Portugal) 15 July until 18 July. 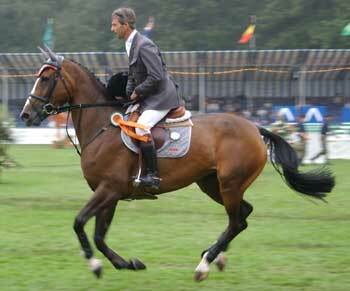 04-jul-2004 Picobello's Allaerd wins Grand Prix held in Moorsele. Picobello's pony, Allaerd, wins the Moorsele Grand Prix only one week away from the Belgian Championship. Allaerd has already proved his capacities, technique and power before with his previous rider Niels Staes, among others he won the Brugge Derby. This experience has no doubt brought on the recent results at an international level. Julie Pascale on Candy Loupe rode a clear round in the Grand Prix and achieved a strong fifth place. 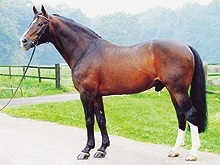 26-jun-2004 Picobello's Pleasure wins Grand Prix held in Redefin - Germany. Picobello's Pleasure, now under the name of Meautry's Pleasure won the extremely highly prized Grand Prix held in Redefin. She beat the European champion Christian Ahlmann who came second and Toni Hasmann acheived a third place. 15-jun-2004 Picobello's Unforgettable and Vaillant are sold. Picobello's Unforgettable (Darco x Landgraf I) (see picture), the promising 7 year old, has been sold to the English top class rider W. Funnel. He will use him further in top class sport. 08-jun-2004 Candy Loupe, a new acquisition for Julie Pascale. Candy Loupe is the new acquistion for Julie Pascale and the combination of Julie Pascale and Candy Loupe hit off immediately during their first performance in Compiegne. They won the opening competition and they achieved a first place in the Mini Grand Prix. 06-jun-2004 Picobello horses in Compiegne. 02-jun-2004 Picobello horses in Reims. Julie Pascale acheived a strong third place in the Grand Prix held in Reims in France. Julie Pascale on Picobello's Talent convincingly achieved a third place in the Grand Prix at the technically difficult track of the lovely competition in the Parc de Pommery. She was the first Belgian combination. 't Is Voltaire who had been selected for the Nations Cup held in Le Touquet really impressed. The Belgians achieved a strong fourth place. Julie Pascale Ruant on 't Is Voltaire achieved a clear round in the second round. Click here for video..
Guillaume Ruant on Extie won the Mini Grand Prix and came third on Picobello's Allaerd. Guillaume on Otrichta won the Grand Prix at the International Jumping held in Fontainebleau. 28-apr-2004 Julie Pascale's top class horse was sold to England. Qui Vive, one of Julie Pascale's top class horses was sold to the English jumping stables of Robert Bevis. The grey, Qui Vive, whose performance was brought up to the highest level in a very short time by Julie Pascale, will be entered by Robert Davis in the 1.50m competition. The first results for Robert Davis are certainly promising. 20-apr-2004 Again a successful weekend for the Picobello stables. Guillaume on Picobello's Allaerd achieved a second place at the Fontainebleau Derby, the largest European International Derby for pony jumping (2.500 participants on 5 tracks). He came fourth in the Grand Prix and on Extie he again won top class in the Mini Grand Prix. 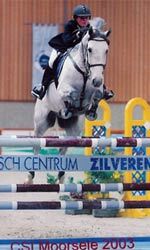 During the same weekend, Julie Pascale on Otrichta won the international competition held in Moorsele and she achieved a fifth place on her new jumper Tropicana. 13-apr-2004 Picobello's Extie is back. Picobello's new video is available. Contact us for a free video at 0475 � 48 99 99 or click here to watch the video on line (20Mb). 15-mrt-2004 Picobello's start for a new season. The work carried out after the winter break was awarded last weekend by Guillaume and Julie Pascale achieving a total of 5 places of honour. 11-mrt-2004 Picobello's 't Is Voltaire wins in Wisbecq. Julie Pascale Ruant on 't Is Voltaire wins the major competition at the International Jumping. An off-spring from 't Is Voltaire achieved a first place in the free jump during the competition for 2 year olds held inTorhout. It is typical for 't Is Voltaire that he passes on his jump aptitude and jump capacity to his foals. All sections on our website are now up to date. Our video clips which you will find on the video pages or on the pages for competition horses are to be recommended. This week end were the Picobello horses participating in Aarchus and obtained very good results. Our stallion 't Is Voltaire was ridden for the first time by Julie-Pascale and they jumped 4 times clear round together. Once again 't Is Voltaire showed us his lovely temperament and enormous scope. Picobello Allaert and Guillaume finished 3rd in the Grand Prix. Picobello Pleasur has been sold to the top showjumping stables "Rotchild". Riders Eric Van der Vleuten and Dermott Lennon have brought on this mare to its top level and we are very thankful to them. Julie-Pascale had some very nice placings at the Mechelen show. She was 6th in a qualifying competition, finished 5th in the Small Grand Prix and would have won the CSIJ Grand Prix if it wasn't for an unlukily refusal in the jump off. Guillaume wins the fancy dress class with Picobello Allaert together with Bénédicte Schattemand and Layka. At the very nice pony and young riders show in Hengelo, The Picobello youngsters picked up a lot of ribbons. Picobello Skylight won the Small Grand Prix and finished 6th in the Grand Prix. Julie-Pascale finished 8th in the Grand Prix with Picobello Qui vive. Julie-Pascale and Guillaume were also placed in other classes. Julie Pascale distinguishes herself at the Belgian top. After her excellent performance at the International Jumping held in Luik, Julie Pascale participated in the first Moorsele Winter Cup with her two horses Picobello's Qui Vive and Picobello's Talent. Guillaume came first in the Verona Grand Tour. Guillaume achieved a first place on his fast pony Skylight at the CSIOPA Grand Tour held in Verona. He came second in the Nations Cup and achieved a sixth place in the Grand Prix. 't Is Voltaire gets into action again. 't Is Voltaire gets into action again after a rest. During his first competition he won with a strong clear round. Julie Pascale great among the greatest. Julie Pascale on Qui Vive achieved twice a strong seventh place in the 1.35 en 1.40 competition at the International CSIA Jumping Event held in Luik. In the 1.40 competition she was just in front of Nick Skelton and only just behind Eric Navet. Guillaume on Picobello's Skylight won a competition at the Moorsele Indoor International and Julie Pascale won on Picobello's Ostrichta. Guillaume rode for the first time on his new top class horse Picobello's Allaerd and was successful in the Grand Prix. Julie Pascale also rode her top class horse Picobello's Qui Vive internationally and with success. Pleasure particpates in World Cup. Picobello's Pleasure achieved a strong eighth place at the World Cup held in Athens. 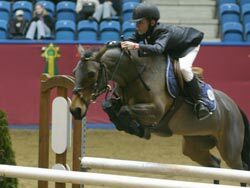 Dermott Lennon, the current Irish World Jumping Champion rode on Pleasure. Picobello's Aertbreaker has been approved . Picobello's Aertbreaker, our Heartbreaker, son of a Ramiro mother has been approved at the Stallion certification in Zangersheide. According to insiders Aertbreaker is an asset for the Belgian stud farms. 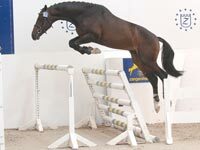 A modern bred stud horse with an excellent jumping technique and jumping power. Aertbreaker and 't Is Voltaire will be available at our stud farm for serving. Soon our website will be updated with a separate section for the stallion Aertbreaker. Meanwhile you can watch the video of the stallion certification in Zangersheide. Picobello's Fextok who has performed extremely well during the last few months has been sold to Denmark to strengthen their National Team. Picobello 'T is Voltaire has successfully made his first international equine appearance. 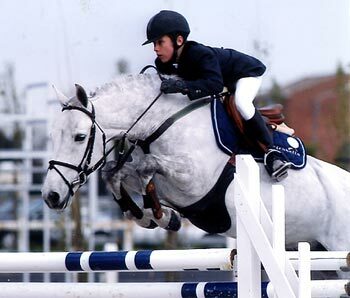 At Amiens (France), as a 6 year old, he scored well in the 1.45 m category technically difficult course. 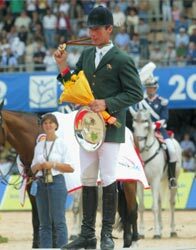 Eric Van der Vleuten on Picobello Pleasure won the Small Grand Prix during the International Jumping competition at Pinerlo in Italy. This is the third victory within a fortnight. 3 times the Belgian Anthem. Today was a real Belgian success at the CSIO P held in Arezzo in Italy. The Belgian flag was hoisted three times in the luxurious equestrian complex in Arezzo. In the Grand Tour Guillaume was a good four seconds faster than one of France's most famous stud horses, Dexter. Picobello's Pleasure takes place in the final. Dermott Lennon, the current World Champion, on Picobello's Pleasure achieved a strong seventh place in the final at the Benelux Championship held in The Hague. Pleasure, the 8 year old, was the youngest participant in the World Championship. Guillaume is the new 2003 Belgian Champion for Ponies. Guillaume won the first as well as the second qualification in the Belgian Championship, so he achieved a first and second place in the list of rankings on Saturday evening. Guillaume chose Picobello's Extie to ride the final and he also won the final competition on Sunday. During the CSIO in Rotterdam, Eric Van der Vleuten achieved 2 victories on the 7 year old Picobello Pleasure. In the Grand Final he came third and as a result was voted Best Youngster of the Tournament. 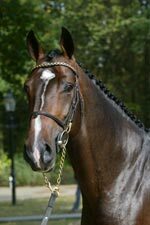 Picobello Pleasure and Picobello 'T is Voltaire have also been selected for the World Championshop in Zangersheide. It is now the third time in a row that horses from Picobello have been chosen to participate in this prestigious World Championship. In Diksmuide Julie-Pascale on Elmara was the winner of the Belgian Cup for ponies. During the weekend she achieved a faultless result in the difficult and technically constructed courses. Julie-Pascale on Ballybin also won the Petit Grand Prix. Guillaume on Picobello Skylight came a good third in the 1.15m trial. Talent, 5 out of 6 classifications. Julie Pascale on Picobello's Talent achieved 5 classifications out of 6 during the Jumping Event held in Auverre � Normandy (France). Julie Pascale on Talent came a strong second in the finishing Gand Prix. During our Foal Show on the 19th October 2002, Herr Mayer (the buyer for Paul Schockem�hle's stables) will be a member of the jury, together with Paul Hendrix (Emile's brother) who is a pre-eminent specialist in foals and young horses. 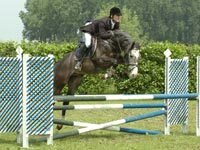 At the International Jumping held at Saintes Julie-Pascale achieved 2 victories and Guillaume earned a respectable sixth place in the Petit Grand Prix. At the Grand Beach Jumping Competition Guillaume Ruant won the Grand Trial for ponies. Guillaume's sister, Julie-Pascale won the Lady's Cup. The first prize in the Lady's Cup was an exclusive wristwatch to the value of � 4,000. Eric Van der Vleuten came second in the Grand Prix for young horses held at Aarhus in Denmark. During the last day of the European Championship for ponies in Lanaken, Julie-Pascale came first on Elmara in the Grand Prix of the European Championship. There was a good turn-out of 52 starters in this 1.30m category. During the jump-off Julie-Pascale on Elmara rode a super fast and faultless jump-off with a good 6 second lead over the second place. Click here for results. The Belgian Team came away from the last trial in 7th place. Click here for results. Julie-Pascale was also voted Best Rider of the Tournament. Today Guillaume won the 1.15m trial at the European Championship in Lanaken riding Extie. Guillaume on Extie rode a good 3 seconds faster than the second placed rider. Click here for results. Julie-Pascale won the difficult entrance trial on Friday 26/07 on Elmara. Guillaume came a good eighth on Extie. Click here for results. During the Final Trial for the European Championship, Julie-Pascale achieved a respectable 7th place and was the best Belgian rider. The first round was completed without faults, during the second round in which the height of the jumps was raised to the maximum (1.35m to 1.40m) Ballybin was given 6 faults and finished in 7th place. Click here for complete results. Julie-Pascale has made a perfect start in the European Championship for ponies in Lanaken and she has earned a place in the final after the 2nd qualification round. This means that Julie-Pascale has for the 4th time in a row earned a place in the final of the European Championship for ponies. In the sub categories Julie-Pascale was twice placed second. This was the last Championship for Julie-Pascale, as next year she will transfer to the Juniors League. Congratulations to Julie-Pascale who won the Grand Prix in Lummen on Elmara. (click here for results) The Belgian Team also won the National Prize; in which Julie-Pascale rode Ballybin. (click here for results) As a result of these 2 international victories, the Picobello Team has good prospects for the European Championship in Lanaken (from 23rd till 28th June). Congratulations to Julie-Pascale and Guillaume Ruant with their 5 victories at the Bruges Jumping Competition. Julie-Pascale came first (Ballybin) and second (Elmara) in the Grand Prix, first in the Grand Tour on Ballybin and first in the Tournament of the Future on Ballybin. Guillaume on Skylight twice came first in the 1.15m category. Congratulations to 'T is Voltaire with his eighth double faultless round in the cyclus in Hulsterlo. He achieved the maximum score. 'T is Voltaire jumped for the seventh time this season a faultless round during the cyclus for 6 year old horses in Libramont. As a result of this he has earned a place amongst the group of 275 top horses. 'T is Voltaire jumped for the sixth time this season a faultless round during the cyclus for 6 year old horses in Filot, furthermore, he was the eventual winner of this competition. An excellent result for 'T is Voltaire and for Stefaan Van de Walle, who has retained his form after his operation. 'T is Voltaire has achieved this extraordinary performance this time ridden by Dominique Hendrix. The regular rider Stefaan Van de Walle is recuperating from a neck operation. We wish him a speedy recovery. Belgium won the Nations Cup for ponies at the International Jumping Competition held in Diest. The Belgian team consisted of the following riders: Pieter Devos, Christelle Heymans, Judy-Ann Melchior and Julie-Pascale Ruant. 'T is Voltaire has again had a successful start in the Cyclus for 6 year olds. In Chatelet he came an excellent third with two faultless rounds. During the Zangersheide Stallion control, our stallion 'T is Voltaire has successfully been reapproved. For more information click here.